It's extremely embarrassing to forget how overwhelming some classic albums can be but that's what has happened to me with "Crime of the Century." I guess it's somewhat excusable considering all the music I've collected over so many years but rarely do I pull an LP out of the stacks and find myself going ga-ga over songs that are well over three decades old but that's the case here. These tunes are still as relevant and astonishing as they were in 1974 and that's no exaggeration. At that point in time progressive music (with the exception of the eternally popular "Dark Side of the Moon") had drifted off the radio play lists. ELP's "Brain Salad Surgery" had come and gone the year before and neither Yes' "Relayer" nor Genesis' "The Lamb Lies Down on Broadway" were exactly conducive to being heard on even the most liberal FM station. The atmosphere was ripe for something new that contained all the elements of the best bands and artists of the early 70s and Supertramp was there to fill that prescription. While some might argue that the total sum of the group's career output categorizes them as artsy pop, there's no doubt in my mind that this album in particular is nothing less than imaginative, progressive rock in its purest form. The soulful harmonica wailing over a very ominous undercurrent will make your prog antenna stand up straight as "School" starts things off perfectly. A well-timed, bone- chilling child's playground scream kicks the band into a driving rock beat that will dispel any notions that this is going to be lightweight fare. I'm not sure this really qualifies as a concept album but there is a theme of being introverted and "different" that runs through the majority of the songs and this is no exception. (However dark or depressing the lyrics may get at times, however, there is no sense of doom or despair manifested and that's one of its many charms.) Roger Hodgson's piano lead is exemplary and the song, like everything on this record, is a model of intelligent arranging. I can only speak for those of us living in North Texas in that era but, with "Monty Python's Flying Circus" TV show being all the rage (Dallas' PBS affiliate was the first to air it in the US), anything remotely British garnered immediate attention. That's just one of many reasons that "Bloody Well Right" was the right song at the right moment. For one thing, vocalist Richard Davies didn't try to suppress his accent and the undeniable, tongue-in-cheek irony of the song made it irresistible. You gotta love the clever electric piano intro and the fat horn section sound as well as the lumberjack chorus. John Anthony Helliwell's upbeat sax phrasing toward the end gives the tune a nice Traffic feel, too. I'm so enamored with "Hide in your Shell" that it's nearly impossible to describe it. I'll just say that it may well be one of the most melodic tunes you'll ever hear and if you can imagine a blend of Genesis and The Beach Boys you might get some idea of how great this song is. The superb dynamics written into this number keep the song from ever becoming predictable. "Asylum" starts with a simple piano and vocal, giving it a narrative quality that highlights the poignant lyrics. The singer pleads "Don't arrange to have me sent to no asylum/I'm just as sane as anyone/It's just a game I play for fun, for fun." It has a palpable Elton John aura to it throughout that oozes class. (Don't knock Elton. His early 70s work bordered on prog from the get-go). Pay attention to Davies' vocal. It's both defiant and sympathetic at different junctures of the tune to great effect. I know many of you are tired of hearing "Dreamer" but when it first came out it put fresh back in the word "refreshing." It was then and for all time to come an honorable single that avoids the hackneyed verse/chorus formula that characterized so much of Top 40 radio in those days. "Rudy" is a nice change of pace. It almost has a Billy Joel-like, contemporary New York feel to it (except that Mr. Joel was still in his "Piano Man" phase in 1974). This song, like the whole album, is a journey through varying musical moods and sequences but it's the incredible orchestral score that will demand your attention. It's out of this world. "If Everyone Was Listening" has a nostalgic air to it that brings to mind the Beatles mixed with Elton. I get the feeling that it's an ode to the failed utopian dreams of the 60s flower-power generation with lines like "If only we had listened then/If we'd known just how right we were going to be/For we dreamed a lot/and we schemed a lot/and we tried to sing of love before the stage fell apart." This time Helliwell adds some cool clarinet to give it just the right feel. And I must mention the flawless rhythm section of drummer Ben Benberg and bassist Dougie Thompson. They are solid as granite from the first tune to the last. I can't decide if the apex of the album occurs on "Hide in your Shell" or on "Crime of the Century" but I know in my heart I'm leaning toward the latter. It's as challenging to the senses as anything from Pink Floyd (and that's a huge compliment) and the piano sound, as well as Hodgson's guitar work, is strikingly pristine. The subject matter of pinning blame for the pollution, corruption and unabated greed of the world on some imaginary, corporate "men of lust" when the trail ultimately leads right back to our own doorstep is eye-opening enough but it is the exquisite, gorgeous instrumental middle and end that will devastate you. I mentioned Elton's music earlier and it was the majestic orchestral scores supplied by Paul Buckmaster that elevated much of his music into the stratosphere and Richard Hewson does the same for Supertramp here. I actually get an emotional lump in my throat as it builds and builds to the dramatic climax. Unbelievable. 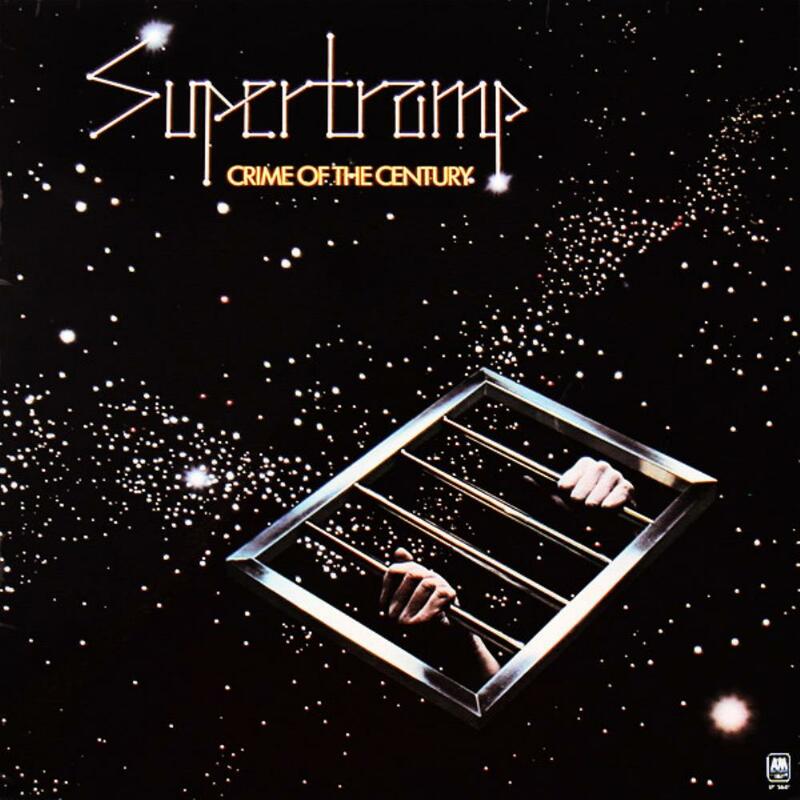 Supertramp went on to become a hit machine and a lot of folks think only of those chart- toppers when they hear their name mentioned but make no mistake. In 1974 they created their masterpiece with this album and it still packs a potent prog punch today while sounding as high-fidelity as an Alan Parsons project (pun intended). And, while I mentioned several bands and artists of note during this review I hope you don't get the impression that the music is derivative. On the contrary. I dropped those names only to convey the lofty plateau these songs reside on. Now that I have re-discovered this gem I plan on putting it into heavy rotation on my listening schedule and I suggest you do the same. You won't regret it.